This is easily one of the saddest pizzas in all the neighborhoods of Pittsburgh. Last time we visited Tavern 245 in 2011 I was really impressed by the quality of the food. I still think they offer some pretty decent selections, but I think they missed the mark with the pizza pictured above. Some of the dishes I've enjoyed in the past include the Italian egg rolls, the chicken wings and the trio of sliders. I cannot say the same about the pizza of the day. 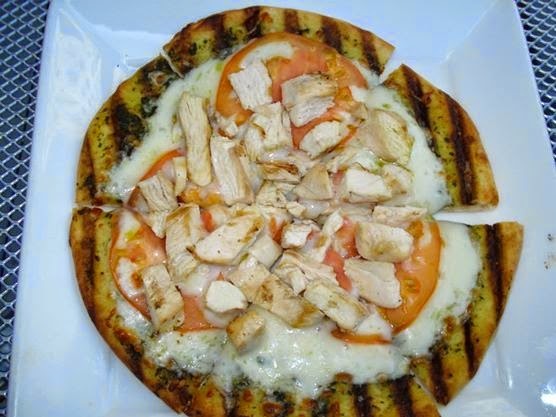 This "pizza" is what would happen if you took a piece of bread, some mediocre cheese, an unripe tomato and some unseasoned chicken and put it in your toaster oven. Yes, this concoction might sustain you, but it is hardly worth sacrificing several bud lights for in a bar setting. In theory I think this dish could have been fine. However, the execution was poor at best. Despite this sad pizza I still highly recommend visiting Tavern 245 for their awesome roof top deck, reasonable drink prices and other acceptable food selections. Fried cheese is one of those dishes I almost never comment on as I feel that I am served generic Sysco brand frozen cheese sticks about ninety-five percent of the time. Tavern 245 is part of the five percent exception! 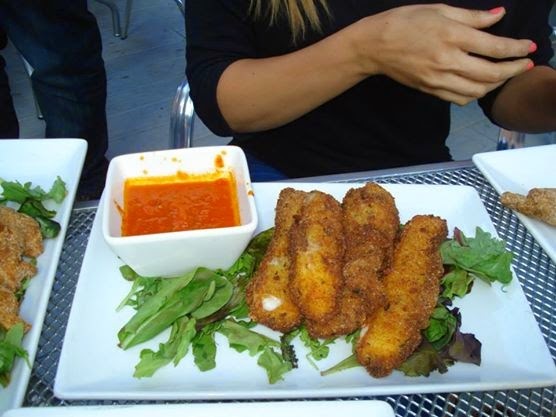 These hand breaded cheese sticks were fantastic.They were further bolstered with a nice serving of vodka sauce. I love vodka sauce and I'm honestly sad that it isn't served more often. When I was studying for the bar exam some nice lady on a video tape named Paula Franzese claimed her father was the dude who invented vodka sauce while working at a restaurant in New York. However, according to www.thekitchn.com, many food historians credit chef James Doty with the invention of the sauce. In the end it really doesn't matter who invented vodka sauce as long as I start seeing it appear more regularly on my dinner plate.